One of the more common questions I get from indie publishers with a print book is: what is the difference between Amazon Advantage and Amazon Marketplace? Well, few actually phrase it this way but if they knew what to call the two programs they would use these terms. Amazon has so many programs and acronyms—Associates, Advantage, Marketplace, MatchBook, KDP, FBA, AWS, ACX, etc.—it’s difficult to keep track of all the services, much less specific program features. Advantage is a consignment arrangement; your book is part of Amazon’s inventory. When someone buys your book, they pay Amazon and Amazon ships them the order. Marketing Amazon shows your book to shoppers when they look for it. As an Advantage member your book is marketed and recommended to readers like most other books on Amazon. E.g. Readers that bough this book also bought/viewed… This is a powerful benefit. Perception Even though you are the publisher your book will say it is available from a third part seller. Shoppers cannot tell the difference between a book offered through the Advantage consignment program and any other book retailed by Amazon. Pricing You control your price. This can be important if you want to protect the pricing you extend to your distributors. As the retailer Amazon is free to set the price as long as you are paid your wholesale price. This is not different than any other retailer. I often point to the fact that more than 30% of all product searches on the Internet now begin at Amazon (9% for Google; Source: Internet Retailer Magazine). Book publishers can’t ignore Amazon's power to impact their business, positively or negatively. If your business is in this situation I invite you to contact me about how I can help your business develop and implement an Amazon marketing strategy. One other point to mention is if you use the advantage system you also have to pay a ‘storage’ fee for the space your books take up in the Amazon warehouse. Over time that can mount up a bit if the books don’t sell very fast..
I’ve never been charged a fee. Can you provide a link to an explanation? Great article…very well written and informative! Would you be available to talk with me a little more about this? I have some questions about what direction to go for our specific book….and Amazon is IMPOSSIBLE to contact. Nicole, you can ask it here. Perhaps I can point you to an Amazon resource, or, if this is really specific to your needs, we can setup a consult call. I charge $99 for 30 minutes. Email me via the contact form if you’d like to arrange a consult. Thanks for stopping by. Currently we are sellers on the Marketplace with fulfillment by amazon and merchant fulfillment options for purchasers. We have considered the Advantage program but do not think it is suitable for us as a small publisher. Rather, we are considering an Amazon Webstore and wonder if you have an opinion about the webstore option for publishers like us. It seems to offer SEO (which we have never managed to figure out how to do) and also to allow us to direct purchasers to our own website. The monthly fee is higher than other options and we have months when we sell very few books. Nevertheless, we think it may improve our sales as amazon has an incentive to market the books and since we cannot place ad on amazon as a bookseller. John, this may be too obvious but I’d crunch the numbers for the options for a full year. I’d make some assumptions on sales and then test them in the Excel model. I suspect you’ve tried to build some type of store for your imprint and use Amazon as a marketing tool…that’s the long term play, as you probably know. Thanks for the info. After reading Advantage agreement & your info here, several hours of research & crunching the numbers, I anticipated a $9 profit. So I signed up for the Advantage program. Correction on the percentage mentioned in your post, it’s 55% going to Amazon & 45% to the author. Then I learned you cannot use USPS when you mail your book to Amazon & they will only mailing the number of books ordered. It was my understanding I could mail 50 books to one place. & Amazon took care of mailing each book. But due to the multiple warehouses across the country, you can only send the amount of books ordered to the warehouse they assign you. So my book lists for $24.99, I get $11.25, Fed Ex postage is $8.58. It’s a 152 page soft cover, book, this is not express, & the lowest price FedEx shipment. Amazon insists in using UPS or FedEx. You have to package the product properly including, bubble wrap, proper envelopes, several forms to fill out per Advantage with each order. & print an Amazon shipping label. My profit was $2.67. Factor in time, gas & packaging supplies, and it’s zero profit. I’m beyond disappointed & thought authors should be clear on the process. Your frustration is shared by many others. I should also point out that the 55% that Amazon takes (thanks for pointing out the typo) is not unique to Amazon, it is an industry standard for these types of sales. IngramSpark is also 55% although they offer publishers a second option of 40% (but not all stores will accept that). FWIW, I mailed to their warehouse using USPS Priority Mail as recently as September of 2014. Maybe UPS or Fedex is a new requirement…or not enforced in practice. I sell CD’s and a live concert DVD’s from one artist ( my father) and have been with Advantage for over ten years. I’ve always shipped my product by USPS media mail. ( formerly known as book rate) I’ve never heard of the restriction mentioned above. I’ve also never been charged a storage fee but then again my item is a regular seller. Small numbers but continuous. I imagine if they were collecting dust on the Amazon shelves, there may be fee imposed. Seems only fair. Excellent article. Very informative and helpful. I work with a small publisher who is trying to decide between these two Amazon selling options. You mention that your listing on Amazon will look “less professional” if it’s in the general marketplace as opposed to via Amazon Advantage. What are the specific perks you get when listing a book via AA that you don’t get via marketplace? Does the book listing page look any different? If you have an example of each, I’d be very grateful if you’d share it. Joel, I created the Kindle eBook for this print book a couple years ago and the publisher didn’t want to use Advantage. It doesn’t look bad but note that is says it is available only from third party sellers. (as opposed to Amazon, the retailer). So they are saying: you are on your own folks. I am an indie filmmaker considering which way I want to sell my movie on DVD/Blu-Ray via Amazon. This website is the only place I could find anyone even coming close to explaining the difference. What is the difference between selling via advantage or via marketplace and choosing fulfillment by Amazon?? First off, if it’s under the banner of marketplace, what do they charge for fulfillment? That is listed no where! And can I just ship a box of product to one place? Regina, with Advantage you are basically treating Amazon as your retailer. You list the product on consignment, recommend a price, but they charge the customer what they want. Marketplace is more like a fixed price eBay sale. When you add FBA, it is similar to Advantage, except I think that solution is geared to larger vendors. Most indies–book or video–would choose Adv or Marketplace. Sorry I can’t add more detail about FBA but here is a short link to take you to info about this program: http://www.epubhelp.com/fba (epubhelp.com is a sister site of authorimprints.com for DIY publishers). Sorry, I did not understand your reply at all. I am trying to decide BETWEEN 1. Amazon Advantage or 2. Amazon Marketplace with FBA. As far as cost, control and ease of use. I cannot find what the cost is for FBA at all. That sort of information can change frequently so I suggest you contact Amazon directly. Thank you so much for this helpful article. I read an entire book on selling on Amazon and your article taught me more! I already sell one product on Amazon Advantage but will likely be switching to Marketplace for the pricing control. Beyond this, I have a question I cannot seem to find an answer to anywhere on Amazon. I have MP3 versions of two guided meditation CDs, as well as MP3s of teleclasses that I want to sell on Amazon. Try as I might, I can’t find out how to place these in Amazon. There don’t seem to be any categories for this. Any suggestions/advice/info? Thank you so much. Hi Teresa, I’d be surprised if this isn’t supported. I don’t know the answer off the top of my head. If you have an Adv or Marketplace account you should message Amazon. Best of luck and glad the article helped you. Can Amazon sell the book at less than 55%? This is the only benefit I need from Advantage. Could I not use Marketplace, then pay several friends to purchase my book and a similar one in order to achieve the same effect? I don’t understand your question. Like any retailer, Amazon can buy something and sell it for what they wish (subject to various laws). Can you provide an example of what you mean? Yes, I’ve heard of people doing that and it can work. Keep in mind that their software may treat books in Advantage more favorably than those in Marketplace. Like any retailer they want to maximize their revenue. I have never tested this and I have not heard of anyone trying. If it does work, I wonder how long it will last. I got an email saying that Advantage is creating more benefits and annual fee for 2016 is $99. I frequently get an order for say 1 book from Advantage – and as someone pointed out earlier – once i add in the postage from Canada, the mailing envelope etc – I am spending more money than the $7.18 that they give me for a sale. I see some people are able to store inventory there – that would be very helpful. Do you know anything about that? I have not figured out a way to actually talk to anyone at Amazon. I have not been selling anything for months. Please someone help me find out why! I have nine self published paperbaoks and nine kindles for sale. At this point I don’t know if they are listed as marketplce or advantage. You need to contact Amazon or your publisher, whoever set up your books. We are a private company and could help but it would be a consulting arrangement. More details when you click CONSULT on the website menu. You need sales volume (which means reader demand) for Advantage to make sense financially. You can try Marketplace, or look up FBA: Fulfillment By Amazon. They were always “Do Not Reply” messages. I searched the page for that word but didn’t find it. It is an older post so I can’t recall everything there. Let me know where in the post you read that and I’ll try to help clarify. Guess what? The Advantage Program will now be charging $99 per year for their “updated” and “improved” services of which several of them will include additional charges. I have had my books on Amazon for over 10 years and have seen any returns diminished to the point where I owe them money every year. I am finding a different way to sell my books, through Facebook and web site and personal appearances. I am very resentful of the power of this corporation and the ‘advantages’ they take over their vendors. Thanks for letting me vent. As a small publisher I am finding there is NO advantage to using Amazon Advantage. We are now paying the $99.00 a year they are charging that they say gives us access to their marketing programs. However, those programs run anywhere from $600-$1500 per book. Way to expensive for our small company. And we find that year after year, due to shipping and packing we are barely breaking even. Do you recommend we try the Marketplace, and if so how do we end our Advantage program with them? I’m actually taking a second look at Marketplace to better understand the differences. I’ll write a new post and notify my mailing list when it is live. I can’t give specific advice Jan. But I can tell you that you generally give up more margin to Amazon in the Advantage program and you should make more with Marketplace. The “problem” is that you will show up as a third party seller and complete with others even though you are the publisher. Seems to me you could move one over and see how that works. (I am a direct vendor to Amazon & have been selling as a direct vendor to Amazon since 2000 (16 years). I am direct with computer software & music instruments & use Advantage for our DVD’s (only option) and I have used Advantage for books as well. One new feature recently added to Advantage is the addition of coupons to the marketing options. You are able to dictate a dollar amount that you wish the selling price to be or a % off. This means it also be featured in a promotional space similar to a Best Deals of the Week. Although with Amazon taking 55% there is typically not much margin to work with. It is a tad (a lot) ridiculous that they are using the 55% “industry standard pricing discount – Amazon broke the standard. They work off a heck of a lot less on other categories (10-30GPM) and that is also on terms based business and NOT consignment. They are raking it in off Advantage sales & they only reason why is because the 55% discount was standard when they started the business. But where else are you gonna go, right? Considering Advantage vs. Seller + FBA for a $47 book. One factor is the need to go international – we want our book posted on Amazon.ca, Amazon.uk, and some others. Doesn’t appear to be any international option for Advantage – does that mean than the world would have to come to Amazon.com, pay the international shipping, and live with the long delivery times? Hi Rick. Canada and the UK have their own Advantage programs. I looked into the UK program 18 months ago and you needed an in-country bank and mailing address to get it setup. Perhaps Marketplace (Seller Central) is the better option here. Nevertheless, I would not be surprised if there were extra shipping charges if this is the only country from which you can sell. Glad to find a [revived] live feed for Amazon Advantage inquires. I have a ‘temporarily-out-of-stock” book on Advantage that is sold out with the exception of a “lost” 150-book restock inventory. We have been in email and phone communication every day with Amazon Advantage for the past 8 days leading up to the last possible day to guarantee shipments in time for Christmas. We know of 31 paid orders placed with Amazon and a few dozen requests for more from direct sources, but nobody can ship! Do you know of any workaround to get to the AA fulfillment folks instead of customer service representatives? Or better, to the legal team. It has come to that! Sorry I am unable to help. Can someone tell me, if I list a book with amazon advantage, who do I need to talk to in order to get the categories/paths for the book set up properly. We want to launch a best seller campaign for a new children’s book but we need to make sure the book is listed in the correct 3 categories first. THANKS! Bonnie, you can select one when you add your book listing via Advantage. Once live, email the Advantage support team to add others, or adjust the one you start with if it doesn’t match the Amazon.com store categories. This thread is great. Thanks for sharing. My question is about selling DVDs. I currently sell on Advantage.com as well as .ca (I’m in Canada). It is my understanding Advantage is my only option. Is that true? Yearly profit is minimal and it’s barely worth it. Hi Susan. Yes you can. Keep in mind that some seller categories require Amazon approval, although I don’t believe that is the case for DVDs. I’m finding this page a bit mystifying. Have I correctly understood that if I publish a book via Createspace, I do not need to have anything to do with either Advantage or Marketplace? Cheers. I have shipped a couple of orders by USPS and got the media rate discount. They received it faster that my receipt showed but My profit margin is so low with Advantage with them taking 55% plus the $99 annual fee that I want to convert it but don’t know to what. I am an indie publisher for 1 book. Recommendations? If you have one book, and you are using POD, it doesn’t make financial sense. The best reason to continue is that you are marketing the fact you have a book so just showing it is important. 55% is an industry standard. Thanks for the great info. Can a publisher print offset and sell on advantage and also use the POD and kindle at createspace? Will amazon get confused? Why would anyone do that? You can use a different ISBN but I think it would be confusing to your customers even if Amazon wasn’t confused. I have a new book that is POD via Ingram Spark and sold primarily on Amazon Marketplace. I am getting a lot of orders, but I want to avoid the “Temporarily Out of Stock” notice on my Amazon listing (it is off-putting to potential customers and customers who do order are suffering long delays to get their books). Would it make sense to join Advantage to “fill the pipeline” and have Ingram-Spark ship to Amazon Advantage on my behalf (so I don’t have to deal with packing, shipping)? In essence, use Marketplace to sell my book and Advantage to keep it in stock. Or does the math (or other reasons) make this idea a poor one? Related Question: Is it typically an either-or issue (a self-publisher either does Advantage OR the basic Marketplace)? I am a small publisher from the UK with about 150 titles. We print and distribute with Ingram but I have been largely dissatisfied with sales and want now to do direct sales on Amazon. We have registered with Amazon Advantage. Will our titles be available across the various Amazon countries or do we need to register separately with each country? Also we cannot find the ‘Contact us’ button on our account – we have uploaded about 40 titles to them and waiting for their orders. Hi Dan, sorry for the delay. It was nice helping you with this. Continued success. Advantage is a country-by-country program. Pamela, anyone can use Advantage, assuming they are the publisher and selling new books. So yes, you can do it. 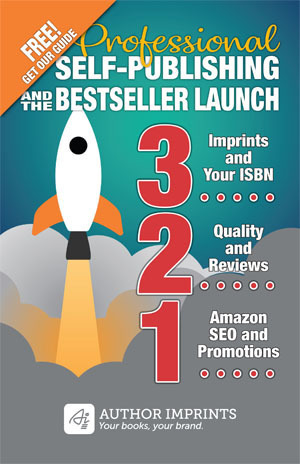 I have more about how I help with distribution on this page: https://www.authorimprints.com/distribution/. Hi! Thanks for this article, it’s really informative. Just wondering, can you generate discount coupon codes with amazon advantage? If yes, is there a limit of the % of discount we can apply? No Clem, you can’t do that. Hi, is it possible to specify a minimum order quantity on Amazon Advantage? I have a book that is selling very well through POD, and have now printed copies that I was planning to ship directly to Amazon. However, despite selling around 1000 copies of the book every month POD, since registering with Advantage last week, I have so far had 4 orders from Advantage, 3 of which are for single copies, and 1 for four copies (all to different warehouse locations). I had expected to be shipping them a box of at least 100 copies at a time, not sending them out one by one! At this rate I will be paying them to sell my books. To answer your question, no. You can specify minimums. The number they ask for is based on your sales history. However, you can submit a ‘stock up’ request. This is in anticipation of a marketing event that might result in lots of orders. You need to convince them and get approval. You will also pay the shipping back to you if the books don’t sell.